The faculty at ASA have benefited from many wonderful, life-giving moments through music, and it is our desire and pleasure to impart a love for music and life to our students, their families and to the wider community in Alameda. If you share our love for music then we hope you'll join us. We don't want to simply provide lessons. We are a community of musicians where students enjoy their music, play together in groups and perform for each other in a kind, supportive and challenging environment. Music shouldn't always be a solo activity - it's meant to be shared. Our greatest passion is for chamber music - playing with others in a small group - and we believe that it's through chamber music that our students will make the most progress musically and socially, and where they'll also have the most fun! But you can't do that if you're constantly struggling with your technique. ​We give our students a strong technical foundation to allow them to become artists of excellence, in a nurturing environment where students of all abilities and backgrounds are able to flourish. ​Our Resident Teaching Artists are distinguished and diverse international performers and teachers, trained to the highest level, and they can show our students how to develop the discipline, focus and skills required to make the most of their abilities. I am so glad that ASA exists here in Alameda. The other options would be less convenient for me in Oakland and Berkeley AND the quality of the instruction is superior. The program ... feels like a family." While learning to play an instrument solo is undoubtedly rewarding, we also love playing with others in small groups (known as "chamber music") and we provide plenty of opportunities for our students to make music with others. 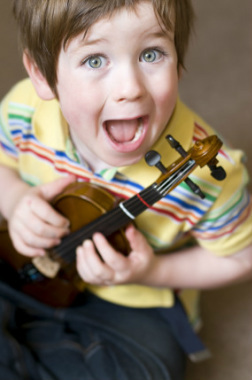 All private students attend regular Studio Classes where they play together and perform for each other. All private students perform in twice-yearly Studio Recitals. As they progress, students may be invited to join Prelude String Ensemble, which meets weekly and where where students learn the basics of playing with others. Intermediate and advanced students may be invited to join Vivo Chamber Orchestra or the Chamber Ensembles program, where they'll rehearse and perform string quartets and other chamber music with expert coaching from one or more ASA faculty. My child is learning how to meet a challenge and how to invest his time and energy in order to flourish. We can all be excellent at our chosen talents, with hard work, dedication, and tons of practice!" If you share our love of music, and want more music in your family and in Alameda then we'd be thrilled to have you join ASA for the next stage in your musical journey. Most students start with weekly private lessons, and then when they're ready, they may be invited to join our Prelude Ensemble as their first step into playing chamber music. 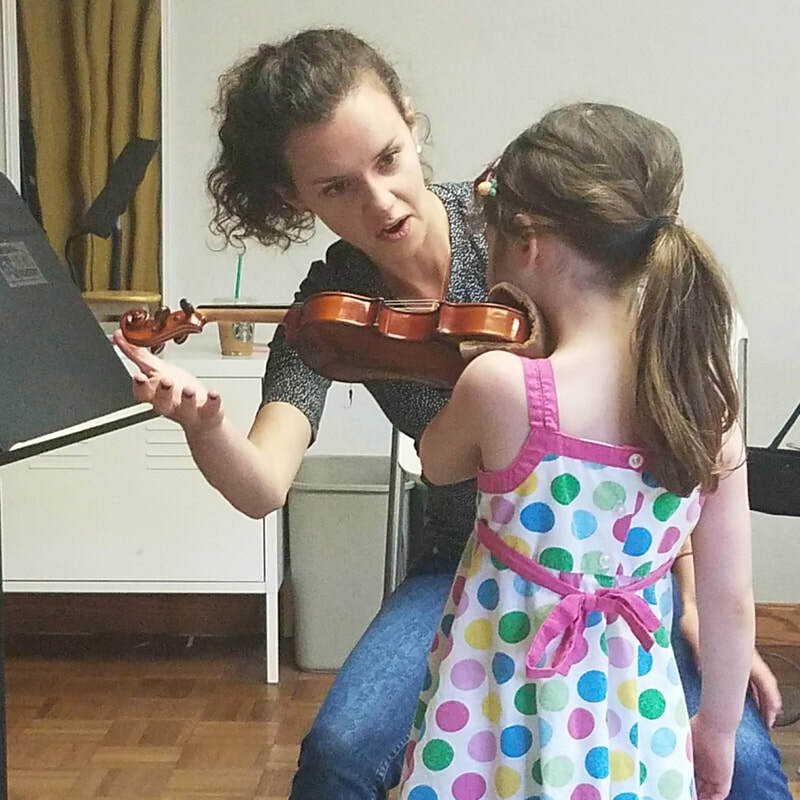 Private one-on-one lessons with one of our Resident Teaching Artists are provided weekly in a 30, 45, or 60 minute format, based on age and ability. The pace and subject matter of these one-on-one lessons is completely tailored to the need and interests of the student. Tuition covers weekly private lessons, Studio Classes and Studio Recitals. ​Providing this opportunity through ASA is one of the best things I’ve done as a parent!" In addition to our regular Studio Classes and Studio Recitals, which all students are expected to attend, we offer two weekly ensembles programs for students who are ready to experience the joys and challenges of chamber music. Vivo Chamber Orchestra gives intermediate and advanced players an opportunity to work on their collaborative playing skills in a supportive environment. Members of the orchestra must also be actively taking lessons (not necessarily at ASA). Prelude String Ensemble gives developing and early intermediate players an opportunity to work on their collaborative playing skills in a supportive environment. The ensemble is particularly appropriate for students with at least one year of experience who are also taking private lessons (not necessarily at ASA). Prior ensemble experience is not required. Concerts: Both Vivo and Prelude have three formal concerts per school year and often have additional opportunities to serve the community with their music. 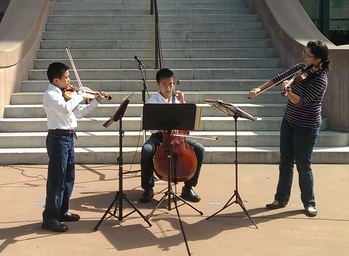 Each February, Vivo has a performance tour of Alameda/East Bay schools. The 2019 tour is funded by a donation by a generous private contributor! Rehearsals: Prelude and Vivo have overlapping rehearsals, so that each group has time amongst both players of similar skill level, as well as in a more diverse group of musicians in a larger setting. This gives students the opportunity to mentor and be mentored by their peers. Prelude meets weekly on Saturdays, 9-10:30am. Vivo meets weekly on Saturdays, 9:30-11:00am. A screening audition is required for prospective ensemble students, so that they may be placed in a group appropriate to their level. Students should prepare their scales, two contrasting pieces, and may be asked to sight-read. String Quartets, String and Piano Trios, and other mixed ensembles, are to many who experience them, the epitome of music making. Students explore amazing repertoire with friends (old and new) in a supportive setting where advanced and intermediate students develop life skills such as musicianship, leadership, communication, teamwork, respect, and listening, all mixed in with a bit of fun and (yes) elbow grease. Chamber Music - Small Ensembles is open to intermediate level plays who are enrolled in private lessons at ASA, at the recommendation of their Resident Teaching Artist. Participants give in at least two performances per year, and some ensembles may be selected to perform in community outreach events. 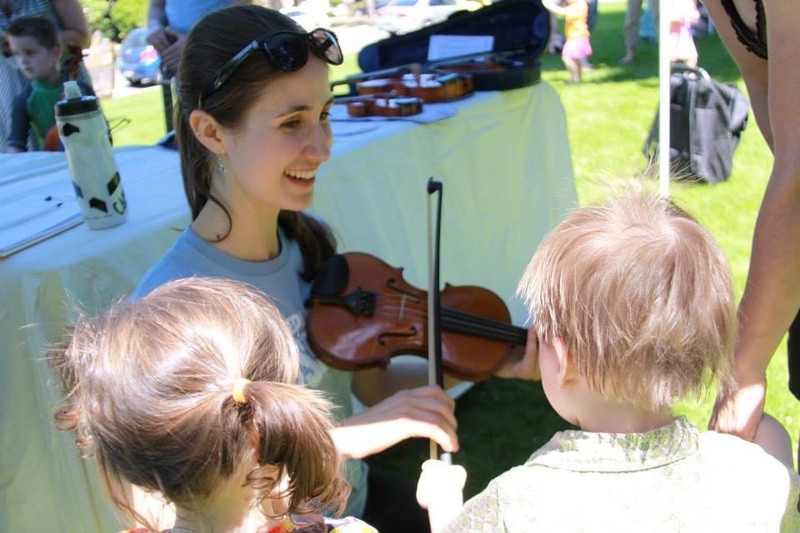 Providing a social aspect to music making, learning how to play with others and learning the basics of chamber music -- all these have brought renewed enthusiasm to my son's violin practice"
Clio Tilton demonstrates the violin at Franklin Park. 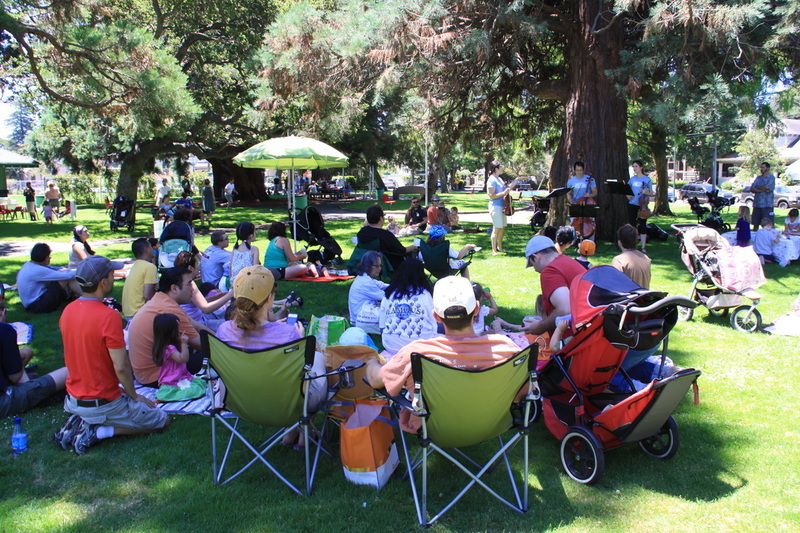 Our summer concerts at Franklin Park are popular with the community. 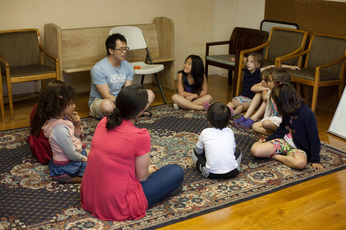 Lucas Chen leads a small group game at a Studio Class.